In 1810, a Bengali immigrant named Sake Dean Mahomed started his own business in London. Although he didn't know it at the time, it was to be a turning point in British culinary history. The restaurant was the Hindoostanee Coffee House, and it was the nation's first Indian curry restaurant house. Indian cuisine didn't catch on immediately -- Mahomed's restaurant went out of business before too long -- but curry wouldn't disappear from the nation's tables. Today, curries from the gentle korma to the fiery madras are a vital part of the nation's cuisine. Founded in 1998, National Curry Week celebrates Britain's love affair with curry. Curry-themed events let curry lovers enjoy new recipes, share their favourite curry-cooking tips and participate in events like an attempt to build the world's tallest tower of poppadoms. But National Curry Week has another purpose as well -- funds raised by its events go to the Curry Tree Charitable Fund, which supports charities and NGOs helping around the world. Funds raised during this year's National Curry Week, which ran from 7-13 October, went to support charities Find Your Feet and WaterAid. Individuals, restaurants, sports clubs, student groups and other organisations all participate in National Curry Week in their own ways. True Indian food lovers showcase their competitive spirit in events such as the speed eating competition, with separate events for poppadoms and samosas. The Great British Curry Quiz tests participants' knowledge of curry and curry culture. Cities around the nation compete for the title of Britain's Curry Capital. In 2012, Bradford took the prize for the third year in a row. 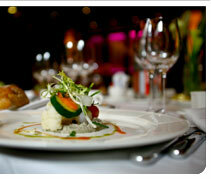 Other events include awards for the nation's best curry restaurants, home dining events and even a poetry competition. The awards for the National Curry Week events will be given at a gala celebration in Kingston on 27 October 2013. It isn't just Indian restaurants that participate in National Curry Week. Award-winning Thai chef Suree Coates of Broseley's The King and Thai restaurant represented Thai curries by creating a special curry menu for each day of National Curry Week. Each day's selection combined local Shropshire produce and traditional Thai ingredients to create a curry celebrating a different region of Thailand. Coates also travelled to Bradford to compete in -- and win -- the South Asian Curry Chef of the Year competition. JUST EAT celebrated National Curry Week with a survey to determine the nation's favourite curry. The results were surprising. While many sources claim that chicken tikka masala -- which may have been invented in the UK -- is the nation's favourite curry, respondents to the survey produced very different results. While Chinese curry and Thai green curry picked up a few votes, Indian curries dominated the survey results. Of the Indian classics, tikka masala came in dead last, suggesting that JUST EAT's diehard curry enthusiasts require something a little bolder to stimulate their palates. Rogan josh performed a little better, as did korma, gentlest of the major curries. The top three slots were taken by more potent curries. Vindaloo and jalfrezi took the third and second places, while the top spot was taken by the fiery madras. Beloved among curry enthusiasts, madras sauce blends spices with smooth yoghurt for a complex mixture of flavours. With British diners seeking out hotter and more challenging curries, and with curries from around the world finally taking their rightful place in the hearts of curry lovers, National Curry Week is set to continue, raising more money for good causes. The 2014 event will run from 13 to 19 October in order to coincide with World Food Day.